The Canon EOS 200D (called the Digital Rebel SL2 in North America) is the the world’s lightest DSLR camera with the world’s fastest AF system. The 24 megapixel 200D / SL2 offers Dual Pixel CMOS AF for the world’s fastest Live View focusing, a vari-angle screen with touchscreen capabilities, a 63-zone metering sensor, 9 auto-focus points, ISO range of 100-25,600 (expandable to 51,200), a guided user interface, DIGIC 7 processor and 5fps continuous shooting, and Bluetooth, NFC and Wi-Fi connectivity. The 200D's video mode offers 1080p Full HD recording at 60/50/30/25/24fps with full manual control over exposure and gain. The Canon EOS 200D is available in three colours - classic Canon Black, White, and Silver & Tan, and has an RRP of £579.99 / €719.99 body only. 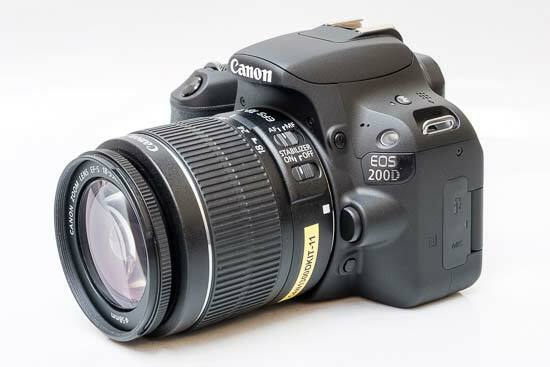 The EOS 200D can also be purchased with an EF 18-55mm kit with an RRP of £679.99 / €839.99. 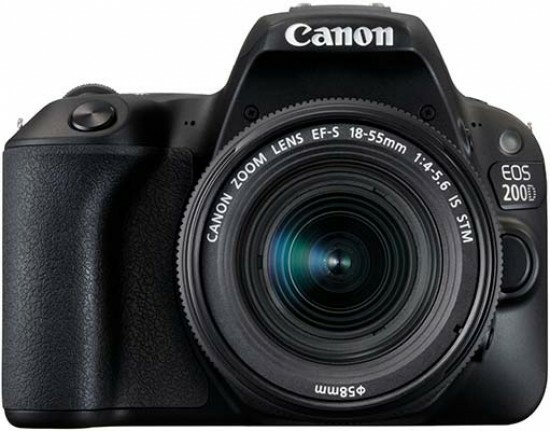 In the USA, the Canon EOS Rebel SL2 has a retail price of $549.99 for body only and $699.99 with the Canon EF-S 18-55m f/4-5.6 IS STM lens. The new EOS 200D / Digital Rebel SL2 is slightly bigger and heavier than the EOS 100D / Digital Rebel SL1 model that it replaces, measuring 122.4 x 92.6 x 69.8mm and weighing 453g, but it's still the the world’s smallest and lightest DSLR camera with a vari-angle screen. Despite its petite size, the control layout will be instantly familiar to anyone who's used a mid-range Canon DSLR before. 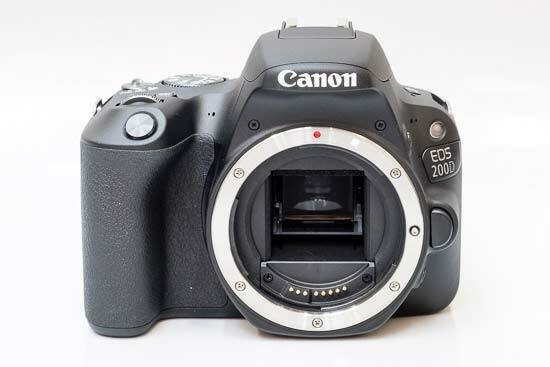 The EOS 200D has a much larger, more pronounced grip than its predecessor, something that we criticized the 100D for. You can now comfortably fit three of our average-sized fingers around the grip, with a little finger supporting the base of the camera, which offers enough support to use the camera with some of the bigger and heavier EF lenses. In terms of build quality, the Canon EOS 200D / SL2 certainly feels solid enough for a consumer-grade DSLR, although as you'd perhaps expect not in the same league as the semi-professional models. Like all of Canon's APS-C digital SLR cameras, the EOS 200D / SL2 is compatible with the manufacturer's entire line-up of lenses, including both EF and EF-S glass. When changing lenses, EF lenses need to be aligned with the red dot on the lens mount, whereas EF-S lenses must be aligned with the white square. We tested the EOS 200D with the new EF-S 18-55mm f/4-5.6 IS STM lens lens, which offers a fairly versatile focal range and crucially includes image stabilisation. This is important for Canon, as competitors like Sony, Olympus and Pentax all offer image stabilisation in their comparable cameras. The difference between Canon (and Nikon) and the others is that Sony, Olympus and Pentax have opted for stabilisation via the camera body, rather than the lens, which therefore works with their entire range of lenses. Canon's system is obviously limited by which lenses you choose, but it does offer the slight advantage of showing the stabilising effect through the viewfinder. Canon and Nikon also claim that a lens-based anti-shake system is inherently better too. The 1,040,000-dot resolution of the rear LCD panel is identical in resolution to the 100D's display. The screen has an aspect ratio of 3:2 - i.e. identical to that of the sensor - so the photos fill the screen completely, with no black stripes along the top and bottom. The LCD screen is now mounted on an articulating hinge which means you can pull it out to face forwards, as well as tilting it downwards and upwards. This articulation is useful if you want to shoot from an awkward angle, but you will have to switch to using Live View in order to take advantage of it. The screen also folds into the body of the camera, which is great for keeping it protected from scratches and so on when not in use. 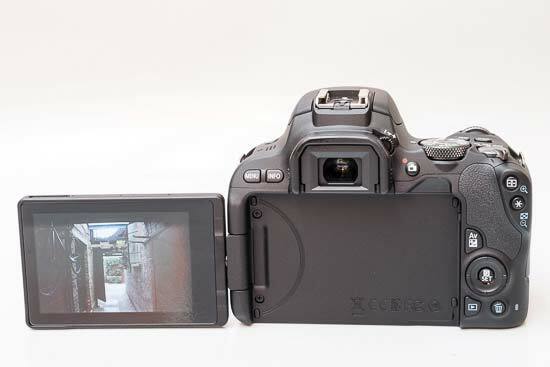 The EOS 200D / SL2 once again features a touch-screen. It supports a variety of multi-touch gestures, such as pinching and swiping, for choosing shooting modes, changing settings, tracking faces, selecting auto-focus points, and focusing and taking a picture in Live View mode. In playback you can swipe to move from image to image and pinch to zoom in and out, just like on an iPad or other tablet device. The ability to focus and take the shot with a single press of your finger on the screen makes it quick and easy to capture the moment. The 200D can tag your images with GPS data (latitude, longitude, altitude and shooting time) using the new always-on Bluetooth connection. We prefer having GPS built into the camera rather than having to sync it with an additional device, although it does consequently suffer from the issue of slightly affecting the battery life. The EOS 200D has also added built-in NFC, which allows you to quickly transfer images to a compatible smart device by simply tapping them together. One of the changes Canon has made to the 200D, compared to its predecessor, the 100D, is the new graphical user interface. It now has a more “friendly” design, which is likely to appeal to those who are new to DSLR photography. It displays helpful advice and hints on how each of the settings you’re using will affect your finished image. For example, if you change the aperture, it will advise that shooting at wide apertures is useful for blurring the background. You can choose to turn off the new GUI if you wish. The EOS 200D's top-mounted shooting mode dial has a multitude of letters and icons. The so-called Creative Zone features Programmed Auto (P), Shutter Priority (Tv), Aperture Priority (Av), and Manual (M) modes. The fully-automatic Scene Intelligent Auto mode analyses the scene in front of you and automatically picking the best settings, much like the systems used by lot of digital compacts. The EOS 200D also has a Creative Auto mode which is targeted at beginners who have grown out of using the Scene Intelligent Auto mode, allowing you to change a few key settings using the LCD screen via a simple slider system for changing the aperture and exposure compensation, or Background and Exposure as the camera refers to them. Creative Auto has been extended with the introduction of Basic +. Essentially a more extreme version of the well-established Picture Styles, this offers nine options including Standard, Vivid, Soft, Warm, Intense, Cool, Brighter, Darker and Monochrome, all of which can be interactively tweaked to suit your taste. Reflecting its more consumer-friendly nature, the 200D also offers ten creative filters, which are only available when shooting in Live View mode and for JPEGs, not RAW files. These include Soft Focus, which dramatizes an image and smooths over any shiny reflections, Grainy Black and White creates that timeless look, Toy Camera adds vignetting and color shift, and Miniature Effect makes a scene appear like a small-scale model, simulating the look from a tilt-shift lens. Two other notable shooting modes are HDR Backlight, which takes three shots at different exposures and combines them into one with greater shadow and highlight detail, and the Hand-held Night scene mode which again takes multiple images at fast shutter speeds and blends them together for a sharp result. There's also a host of scene modes including Flash Off, Portrait, Group Photo, Landscape, Sports, Kids, Food, Candlelight, Night Portrait and, oddly enough for an interchangeable-lens camera, a close-up mode as well. The majority of these scene modes allow users who do not want to fiddle with shutter speeds, f-stops, white balance or ISO settings to let the camera know what type of photo they are about to take, which helps the EOS 200D / SL2 to optimise these settings for that particular subject. The Feature Guide in the EOS 200D's menu system usefully provides a brief description of each setting and its effect. In the Creative Zone (PASM), the photographer gets to set a lot of shooting variables, including white balance, sensitivity, AF mode, exposure compensation, drive mode and so on. Most of these functions have their own dedicated buttons - ISO on the top panel, the rest on the back - while others can be set on the interactive status screen accessible via the Q (quick control) button. Examples for the latter include file quality settings, metering mode, flash exposure compensation and Auto Lighting Optimiser. The available white balance settings are Auto, Daylight, Shade, Cloudy, Tungsten, Fluorescent and Custom; there is no way to enter a Kelvin value manually. You can fine-tune any of the presets using the White Balance Correction feature. The ISO speed can be changed by pressing the ISO button and turning the control wheel in front of it. You do not have to hold down the button while turning the wheel. The ISO speed can be set from ISO 100 to ISO 25600 in full-stop increments. If you turn ISO Expansion on in the Custom Functions menu, you can even dial in ISO 51200; a boosted setting. Auto ISO is also available. The chosen ISO speed is also displayed in the viewfinder. The EOS 200D / SL2 offers a range of three auto focus modes (One Shot, AI Focus and AI Servo) and there's a 9-point AF module, which remains unchanged from the EOS 100D / SL1. Only the centre sensor is a cross-type, rather than all of them. One Shot AF is equivalent to AF-S, while AI Servo is the same thing as AF-C on other manufacturers' models. AI Focus is similar to what some other camera makers call AF-A in that it automatically switches from One Shot AF to AI Servo if a still subject starts moving. As regards AF point selection, it can be done manually by hitting the AF point selector button first, then using the four-way controller to select the AF point. The chosen/active AF point lights up in red in the viewfinder. In use, we found the AF system to be pretty quick with the Canon EF-S 18-55m f/4-5.6 IS STM kit lens. There are a number of drive modes available on the Canon EOS 200D / SL2. These include Single Shot, Continuous Shooting, Self-timer and Remote Controlled Shooting. In Continuous Shooting mode, the camera can take pictures at a speed of 5fps for up to an unlimited number Large Fine JPEGs or 6 Raw files. The metering modes offered by the EOS 200D / SL2 include Centre-weighted, Evaluative, Partial and Spot. The difference between Partial and Spot metering is that the former uses 9% of the frame area, whereas the latter uses only 4% (still a bit too much for spot metering, but there you go). Both of these selective metering modes are midtone-based; there is no highlight- or shadow-based spot metering available as with some rivals. In use, we've found that the Evaluative metering mode provided fairly good exposures with a variety of subjects, thanks to the advanced 63-zone metering sensor. When shooting contrasty scenes, it is worth using the Evaluative mode in conjunction with the Auto Lighting Optimiser feature, accessible by hitting the Q button and using the interactive status panel. The Live View button is within easy reach of your right thumb. A grid line display and very useful live histogram can be enabled to help with composition and exposure, and you can zoom in by up to 10x magnification of the image displayed on the LCD screen. Focusing in Live View via a half-press of the shutter release as normal. During Live View recording you can also use the touch-sensitive screen to change AF point, and to fire off the shutter release if you want to. This setup can be particularly useful for macro and still life shoots, where you’re using the camera on a tripod and don’t want to look through the viewfinder. Live View attempts to satisfy both the consumer and more technical user, with four types of focusing system on offer. Quick AF works by physically flipping the camera mirror to engage the auto-focus sensor, which then momentarily blanks the LCD screen and causes a physical sound, before the image is displayed after about 1/2 second. The other methods, Flexizone Single, Flexizone Multi and AF + Tracking with Face Detection, use an image contrast auto-focus system, much like that used by point-and shoot compacts, the main benefits being the complete lack of noise during operation, and no LCD blackout, and additionally a phase-detection system that's cleverly employed directly on the camera's image sensor plane. All of the effective pixels on the EOS 200D's CMOS sensor are able to perform both still imaging and phase-detection AF simultaneously (dubbed "Dual Pixel CMOS AF"), which makes the three Live View modes almost as quick as the Quick AF mode, especially the Flexizone Single mode, taking a less than a second to focus on a clearly-defined subject in bright light. You can also move the AF point anywhere around the middle 80% of the frame, and the 200D successfully and quickly detected faces in most situations. 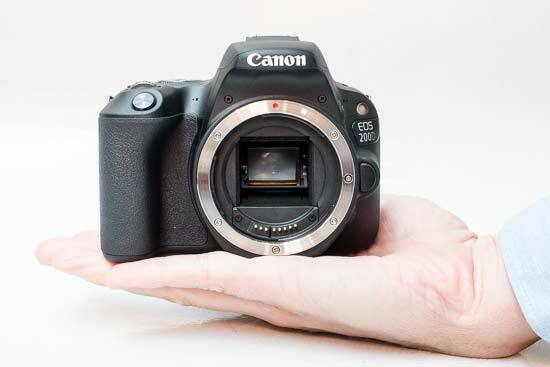 The EOS 200D is the latest Canon DSLR to offer AI Servo autofocussing in live view. Providing you half press the 200D's shutter release, it'll maintain focus before and during a shot with no focusing hesitation at the point of shooting, which is great if you spend a lot of time photographing moving subjects through live view. Autofocus speeds are quick and accurate when using the camera's optical viewfinder in good light, and also when using the Live View mode thanks to the implementation of Dual Pixel CMOS AF. Changing to AI Servo mode allows you to track a moving subject - the 200D copes reasonably well with movement which is not too quick and is moving in a predictable pattern. Shooting at 5fps should give you enough scope for some gentle sports and action, but you may struggle to capture super high speed action. In lower light, the Canon EOS 200D still does well to lock onto the target most of the time. It is very unusual for a false confirmation of focus to be displayed. In very low light, the lens may hunt for a while - depending on the lens you’re using - but it’s only the absolute darkest of conditions that the camera fails to lock on to a subject at all. 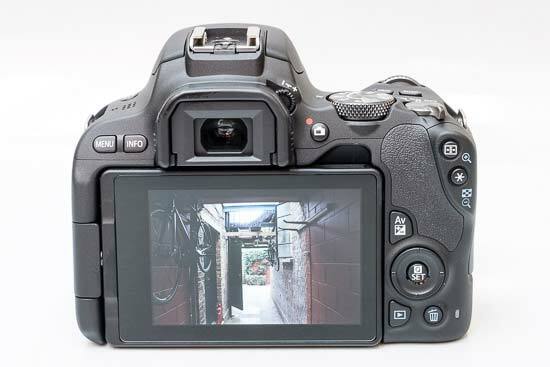 Live View and Dual Pixel CMOS AF are also used for the Canon EOS 200D / SL2's movie mode. If you turn the new On / Off switch to the third position denoted by the movie camera icon, the camera will enter the Live View Movie mode automatically. The EOS 200D has a large choice of frame rates, offering a choice of 24, 25, 30, 50 or 60fps when recording Full HD video clips. Note however that the available frame rates are also dependent on what you have set in the menu under "Video system": NTSC or PAL. The EOS 200D / SL2 can continuously adjust the focus during filming when used with Canon stepping motor (STM) lenses, and you can also initiate auto focus at any time while recording a clip. However, be warned that the microphone can pick up the sound of the focus motor, and the subject might even go out of focus for a few seconds. Setting a small aperture and relying on depth of field for focus is a better idea. Of course you may wish to utilise the DSLR's ability to produce footage with a shallow depth of field, but in that case, it might be a wise idea to purchase a couple of third-party accessories that make manual focusing and focus pulling easier. Unlike the ESO 77/800D, the EOS 200D's built-in pop-up flash doesn't feature a built-in Integrated Speedlite Transmitter for controlling up to two groups of off-camera Speedlites without the need for an external transmitter. Note that it also doesn't have a more advanced PC Sync port for connecting the camera to external lights, all of which rather limits the 200D's use in studio environments. There is the expected hotshoe for use with one of Canon's external flashguns. There is also a built-in microphone for stereo recording on top of the camera, and you can connect an external microphone equipped with a stereo mini plug to the camera's external microphone IN terminal. The Video Snapshot feature allows short clips of 2, 4 or 8 sec to be merged into a single movie file, for footage that is short, easy to edit and of similar lengths to the clips used in most TV programmes. The clips are saved to a Video Snapshot Album and you can even add a soundtrack in-camera. The EOS 200D runs on a larger LP-E17 battery then the EOS 100D which, according to measurements that conform with CIPA standards, provides enough power for 650 images when using the optical viewfinder. The battery can be charged in the supplied LC-E17 charger. Also in the box is a neck strap, a software CD and a user manual, which Canon thankfully provides in printed form in several languages.